Finger Lakes Land Trust acquires new properties to conserve for nature walks, birding adventuresIt’s some of the most unspoiled, spectacularly beautiful and ecologically important land in the state. And if all goes according to plan, it will be accessible to the public for low-impact uses like hiking, kayaking, fishing and bird-watching. 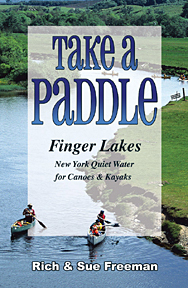 Take A Paddle – Finger Lakes available at http://www.footprintpress.com includes West River & more. In the past year, the Finger Lakes Land Trust has acquired two important pieces of land overlooking Canandaigua Lake and adjacent to the West River — the lake’s principal tributary — adding to the group’s growing list of acquisitions and conservation easements. The goal is to link a crescent of land extending from Bare Hill southward through South Hill to High Tor and the highlands surrounding Naples. This is serene land that is teeming with wildlife, forests, waterfalls and flora — and facing watershed and potential erosion problems if developed. The proposal to create a Canandaigua Lake water trail and birding trail could prevent some of these issues for generations to come. The newest acquisition is a 68-acre property that encompasses a 390-foot cove beach on the east side of Canandaigua Lake, along with extensive woodlands on Bare Hill. Last year, the trust acquired 13 acres adjacent to the entrance to the Bare Hill State Unique Area. And in 2011, Constellation Brands donated 64 acres of an abandoned vineyard in the town of Italy at the south end of the lake — land that the National Audubon Society designated an “Important Bird Area.” Over the summer, the U.S. Fish & Wildlife Service will cultivate native grasses to create a grassland area connecting with the state’s emergent wetlands of the West River. http://www.footprintpress.com includes Bare Hill & more. Connecting these preserved lands to the DEC’s High Tor Wildlife Management Area is significant. High Tor’s 6,100 acres encompass habitats, wooded hills, cliffs and marshlands in the West River Valley — along with South Hill’s 1,000 acres of wooded hillsides. And the West River contains one of the largest wetlands in the state — a popular area for kayakers and canoeists. Bruce Lindsay has managed 700 acres on the top of South Hill for 43 years, and he sees some species actually returning to former habitats, including porcupines, black bears, coyotes, foxes and wild turkeys. The two southeastern hills of the lake are largely undeveloped. Naples resident Kevin Armstrong donated 32 acres of woodland in the area, on steep property along South Hill above the West River. “There are many people who would see the land as something to be developed just for the views alone,” Armstrong says. Lindsay, too, is passionate about protecting this land the Seneca people held sacred. The Pharsalia Woods Unit Management Plan, covering 13,622 acres in western Chenango County, has been approved by the New York State Department of Environmental Conservation. The plan includes four states forests: New Michigan, Pitcher Springs, Perkins Pond and Pigeon Hill which are located in the towns of Pharsalia, Plymouth, Pitcher, and Otselic. The plan outlines management activities on the Unit for the next 20 years and defines goals and objectives for various issues, including biodiversity, timber and public recreation. The Audubon Society has designated a portion of the Unit in the town of Pharsalia as an “Important Bird Area” because it is a regional migratory concentration site and provides breeding habitat for a wide variety of forest nesting species. Currently the forests in the Unit contain 231 acres of roads and developed areas, nine acres of quarries, 11 acres of open land, 58 acres of shrub land, 347 acres of open/shrub wetlands, 1,603 acres of forest wetlands, 751 acres of mixed hardwoods/natural conifers, 5,558 acres of natural hardwoods, and 5,054 acres of conifer plantation. The remote character of many areas on the Unit provide ideal conditions for recreational activities such as wildlife observation, pleasure driving, hiking, hunting, trapping and snowmobiling. The tornado that impacted this area in 1998 created approximately 1,000 acres of disturbed shrub/young-forest land with hundreds of standing snap trees. This area has attracted interest from the public for nature observation, as it is remarkably different from much of the surrounding area. Hunting, fishing and trapping are permitted anywhere on the Unit, except where prohibited by regulation, law or sign. Snowmobiling is one of the most popular activities on the Unit. The Nine Mile Trail on New Michigan State Forest is part of the Corridor Trail 7 and is a popular regional destination for snowmobiling. A portion of the Finger Lakes Trail traverses through the Unit on Perkins Pond State Forest and New Michigan State Forest. New Michigan State Forest’s name will be changed to Pharsalia Woods in the near future to more accurately reflect the history and geography of the area. All maps and information on the DEC web site will be updated to reflect this change. We are at the height of birding season, and beginners can even get started in their backyard or garden. Plus, this is an exciting time for birding because technology has made it a sport and a science that everyone can enjoy. With all the new apps and GPS technology, citizen scientists can indulge their obsessions by tracking ornithologists’ real-time findings. Click here to read about the wonders of birding in The Birding Effect by Melissa Milgrom. Click here to find the Nature Conservancy Field Trips & Events throughout New York State. Link to e-book Birding in Central & Western New York. Central New York is an outdoors wonderland. The diversity of eye-opening and mind-clearing settings a little more than an hour’s ride from Syracuse is incredible. There’s picturesque waterfalls; lush, green hiking trails; multi-facted nature centers; the breath-taking scenery around the Finger Lakes; Adirondack-like woods; nationally recognized birding areas – ocean shore-like settings on Lake Ontario. There’s 15 weekends, beginning with this weekend and extending through Labor Day. With that in mind, here are 15, great Central New York outdoors destinations that will reveal how generous Mother Nature has been to us. Take the Figura Challenge. Visit them all this summer. Take your family, your significant other or just check out the spots yourself. Pack a lunch or dinner. Make a morning, an afternoon or a day of it. Take pictures. Send your experiences and photos to me at dfigura@syracuse.com. Briefly note what you liked, what you didn’t like and recommendations for others who are planning to visit there. I’ll compile your impressions each week on my outdoors page on Syracuse.com. 1). Montezuma National Wildlife Refuge: A mecca for bird lovers. Enough said. The refuge headquarters and visitor’s center is off Route 20, west of Auburn. For more, see fws.gov/refuge/montezuma or call 568-5987. 2). Fair Haven State Park: Features high bluffs above sandy beaches and hilly woodlands. Inland, there is Sterling Pond. Fishing is excellent and very accessible. Rowboats, paddleboats and canoes are for rent. The park is located off Route 104A in Fair Haven. For more, see nysparks.com/12 or call 947-5205. 3). Sterling Nature Center: This 1,400-acre nature center located in the northeastern corner of Cayuga County in the town of Sterling on Jensvold Road boasts more than 10 miles of hiking trails and two miles of lake shore. The center is open dawn to dusk. One particular highlight is its huge great blue heron rookery (nesting area). For more, see cayugacounty.us/web/Departments/Parks/Sterling or call 947-6143. 4).Taughannock Falls: The hiking trails at this state park offer spectacular views and unique geological formations, including the 215-foot falls, which is 33 feet taller than Niagara and is the highest vertical single-drop waterfall in the Northeast. It’s located on the western side of Cayuga Lake off Route 89.For more, see nysparks.com/parks/62 or call 607-387-6739. 5). Fillmore Glen State Park: This park is an oasis of cool, dense woods crowding into a long, narrow gorge. Its hiking trails offer great views and unique geological formations, including five waterfalls and a botanically rich glen. Located off Route 38 in Moravia. For more, see nysparks.com/parks/157 or call 497-0130. 6). Bear Swamp: A picturesque state reforestation area in Sempronius, in southeastern Cayuga County off Route 41A, with several vantage points overlooking Skaneateles Lake. It contains about 15 miles of trails for hiking, mountain biking and horseback riding. Enter by the Colonial Lodge restaurant/tavern in Sempronius. (It’s also a good place for a meal or drink afterward). 7). Baltimore Woods Nature Center: This outdoors gem, located off Bishop Road in Marcellus, features more than six miles of hiking trails, numerous outdoors-related programs and an interpretative center. A great place to check out woodland wildlflowers along hiking trails and also at the center’s Faust Garden. A heads up: no dogs allowed. For more, see baltimorewoods.org or call 673-1350. 8). Beaver Lake Nature Center: The popular, county-run facility offers nine miles of hiking trails and more than 400 annual nature/outdoors-related programs. It offers a rich mix of habitats, that create the possibility of seeing more than 200 species of birds and more than 800 varieties of plants. It also features a small lake, which visitors can enjoy with rented kayaks and canoes. For more, see onondagacountyparks.com/beaver-lake-nature center or call 638-2519. 9). Labrador Hollow Unique Area: Nestled in a valley on the Onondaga/Cortland county line on Route 91 east of Tully, this area offers an Adirondack-like, forestry feel and picturesque Tinker Falls in one part — and an expansive, bio-diverse wetland and pond made accessible by a raised boardwalk in another. The area’s 1,474 acres is a favorite spot for hikers, birders, nature lovers and other outdoor sports enthusiasts. 10) Highland Forest: This county run park, which is tagged the “Adirondacks of Central New York,” is located in southeastern Onondaga Couny in Fabius. It features more than 20 miles of year-old trails for hiking, mountain biking and horseback riding. It also overs group camping sites for youth and a huge lodge with an eye-opening view of a valley below. A self-guided nature trail is the perfect introductory hike. For more, see onondagacountyparks.com/highland-forest or call 683-5550..
11). Pratt’s Falls: Scenic trails leading to a 137-foot waterfall beacon visitors to bring a well-stocked picnic basket and a sense of adventure at this county park, located on Pratt’s Falls Road in Manlius. In addition to hiking, Pratt’s Falls offers an archery range. This park has been used for national, state and local orienteering events that allow participants to navigate through a marked course using only a map and compass. For more, see onondagacountyparks.com/pratt-s-falls-park or call 435-5252. 12). Chittenango Falls State Park: An eye-opening, 167-foot waterfall is the main attraction. Glacial sculpting of 400-million-year-old bedrock is responsible for this scenic feature. An interesting variety of both plants and wildlife may be found along the trails. Located off Rathbun Road in Cazenovia. For more, see nysparks.com/parks/130 or call 655-5205. 13). Green Lakes State Park: The highlights of this popular park in Fayetteville include two glacial lakes surrounded by upland forest. The lakes offer opportunities for swimming, fishing and boat rentals. Hikers, joggers and mountain bikers can take advantage of more than 10 miles of trails. Camping facilities are available. And yes, there’s also an 18-hole golf course. For more, see nysparks.com/parks/172 or call 637-6111. 14). Clark Reservation State Park: This park is a geologic wonder of the last ice age and a botanist’s paradise. The park’s natural features include rugged cliffs and rocky outcrops, woodland meadow, a wetland and glacial plunge basin lake in which surface waters and bottom waters do not mix. Features include five hiking trails. Fishermen and birders are frequently visitors here. For more see, nysparks.com/126 or call 492-1590. 15). Selkirk Shores State Park: This state park’s campsites overlook a bluff on Lake Ontario. In addition to Great Lakes swimming, visitors can expect outstanding fishing and sunsets, plus hiking and biking trails. Birders take note: It’s on the direct migration route for a wide variety of bird species. It’s located off Route 3 in Pulaski. For more, see nysparks.com/84 or call 298-5737. Whether you find a robin’s nest on a statue or a hummingbird’s nest on wind chimes, your picture of a bird nest in a funky place can win big in the Cornell Lab of Ornithology’s Funky Nests in Funky Places contest. With nesting season underway, this contest challenges everyone to get outside and watch nature in even the most unexpected places. The Funky Nests contest begins May 1 and lasts until June 15. Entries may be photos, videos, artwork, poems or stories. You don’t have to be a bird expert or an expert photographer. People of all ages are welcome to participate as individuals or with a class, community center, or afterschool program. Prizes include binoculars, bird feeders, cameras, an iPad and more. Entry deadline is June 15. Find more information about how to find nests, approach nests without disturbing the birds and enter the contest at funkynests.org. A new study reveals that some birds keep their distance from human dwellings, while others cozy up to our homes. The study examined the impacts of the human footprint encroaching on the Adirondack Park’s rural areas, finding that development may affect wildlife several hundred meters from our homes. Click here to read more. Parents are always looking for inexpensive family fun. Timely, with autumn here and winter around the corner, there’s no need to look further than the backyard or the local park. Getting outdoors during the colder winter months can build memories, strengthen relationships, and just be an all-out fun bonding experience for families. Playoutdoors.com offers these great ideas and the gear to go with it. Get to know your local birds. The fall migration of birds is a wonderful time to teach kids about birds. Help kids identify the birds at your feeder by borrowing a birding field guide from your library or using one of the many fantastic online resources for bird identification. 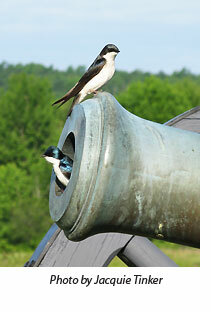 Binoculars are also a great way to see birds upclose and personal. There are many brands of kids binoculars available that are both lightweight and small enough for little hands and eyes. A less expensive sport for people in snowy areas, the nice part about snowshoeing is that almost anyone who can walk can do it. From preschoolers to teen sizes, snowshoes attach easily to boots and provide hours of family fun, fresh air, and exercise. There’s nothing better than sharing quality time and a family meal in the crisp, outdoor air in the middle of the day. It doesn’t matter if you’re going to the local park or farther away these are the moments children will remember sharing when they grow up. Picnic baskets today have evolved from charming baskets we used as kids. Today there are a variety of easy to carry soft coolers that keep food organized and cold at the same time…and also work year-round. All kids need is a few water bottles with a squirt top, some water, food coloring, and some snow. Fill each bottle with water and some food coloring and then head outside. A little imagination and some creativity will result in some great works of art. Playoutdoors.com recommends bottles that are BPA free and that can be easily cleaned. Oh, remember those days building snow people with the first snow fall. t Playing in the snow and packing snow should be fun for kids, not miserable, cold and wet. When introducing little ones to snow play, it’s important they have the right gear: coats and mittens, scarves, hats, and snow boots. Waterproof is the key to staying warm and dry. Waterproof and insulated mittens work best on children to age 7. Gloves are recommended for older kids and teens.